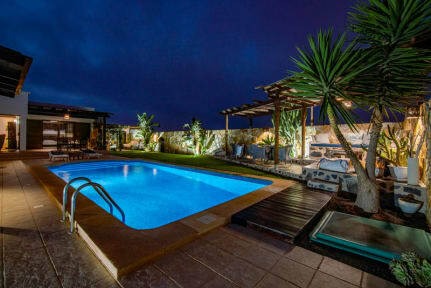 Kalufa House, Lanzarote, Hiszpania : Rezerwuj teraz! Kalufa House accommodation is located in the small little village of El Cuchillo de Tinajo in the north/west side of Lanzarote Island, only 20 minutes far from the airport. The island measuring 80km x 40km and from our location in 40 minutes driving you can reach the most extreme points north and south. El Cuchillo is remained exclusive because it exempt from mass tourism. If you stay with us you'll need a car because the nearest facilities (supermarket, restaurants, bars, pharmacy, ATM) are located 3km far . Kalufa is a detached villa and independent, with a large kitchen fully equipped . The spacious lounge area is comfortably furnished with sofas, table and free WI-FI lends itself to communicate and share experiences with other guests from far and different reality. Enjoy in single , double private bedroom or dorm ... all are equipped with full furniture sets and clean linen for the duration of your stay. Bathrooms with hot and cold water are spacious and comfortable . Outside you will enjoy the privacy of the garden with a large pool and the solarium where you can relax in the barbecue area for evening fun. To complete a big garage will allow the safe storage of your sports equipment, tables , bicycles and whatever else you need . This is a great opportunity to meet different people from all over the world, to share experiences and have a good time. Who have made a reservation are welcome to contact us by mail to communicate your arrival time. Note for allergy sufferers: the presence of cats in the hotel ! !